We love to get notes from people returning from a Thailand vacation; they often ask us about dishes you never find in US restaurants. Having discovered such a gastronomic Alice in Wonderland, many people want to recreate the dishes at home, but don’t know where to start. Lohn Pboo Kem is a dish that you will find in fancy Thai restaurants in Bangkok, in people’s homes and at street food stalls. The small bowl of creamy, salty, sweet and sour sauce is served with a large platter full of fresh local vegetables. Lohn is a class of cooking which combines coconut milk, shallots, preserved meat, fish or seafood, balanced with sweet and sour flavors. The main ingredients, such as coconut milk, shallots and salted crabs, are readily available in Thai kitchens and blend well together. The sour flavor can come from tamarind or other native sour fruits. A hint of sweet can come from the palm sugar or a combination of sweet and sour can come from fermented sticky rice. The popular group of dishes goes back a long time, perhaps before the introduction of the chili peppers by the Portuguese in the 15th century. The chili peppers in this dish is almost like an afterthought. If you are apathetic about spicy food, Lohn lets you dig deep into Thai food history. 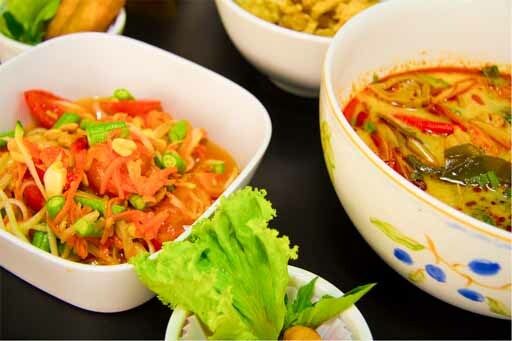 To taste Lohn is to experience Thai cuisine and culture before the modern imports invaded it. The way you eat Lohn is quite elaborate. In order to taste all the flavors; each bite consists of a spoon of rice with a piece of vegetable on top and a little sauce on the vegetable. Once in a while you’ll hit the crab, chew on the it to access this super salty juice inside. The swift contrast of sweet and sour and the ultra salty crab makes a perfect bite. Each bite changes with your choice of vegetable. If you’re planning a trip to Thailand, this is the dish I would recommend you try. And when you come home, now you can recreate it to remind you of the fun time you had. Bitter gourds or bitter melons or karela are known as mara kee nok in Thai. The skin is dark green and bumpy which reminds me of Jurassic World. The flavor is definitely an acquired taste; it's bitter and bitter. People claim the medicinal benefits are numerous from lowering cholesterol to lowering blood sugar. For me, it increases my appetite, especially when I think about how it tastes so good with Lohn Pboo Kem and Mackerel Chili Sauce. In Thailand, there are 2 basic types of bitter melon/gourd, the larger and lighter green bitter melon and the darker green and smaller bitter gourd shown here. The larger bitter melons are used mostly in Chinese influenced dishes while the smaller bitter melons are an accompanying vegetable for chili dips and chili sauces. The 2 types are equally bitter but the larger bitter melons are served cooked as opposed to fresh. 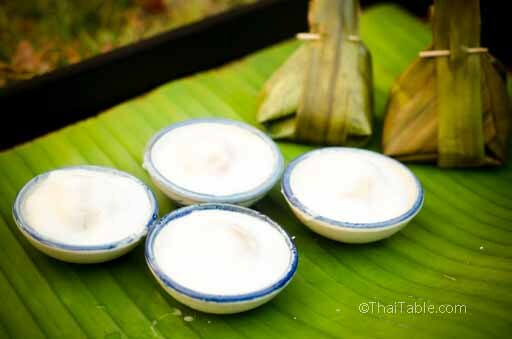 Kanom Sai Sai or Kanom Sod Sai, is a dessert traditionally steamed and sold in banana leaf packets. The name means "filling", emphasizing the importance of the sweet chewy filling. The palm sugar sweetened ball is covered with a chewy wrapper and surrounded with thick creamy salty coconut milk. The salty-sweet smooth flavor and the soft and crunchy mouthfeel makes the dessert delicious. When I was a little kid, some staff of the house I grew up in made and sold Kanom Sai Sai in a Sukhumvit neighborhood. I ate them all the time -- so many that I got sick of them and it's only been this week that I've tried them again. Now, coming back to them is like coming home. I quit eating them because they were overpoweringly sweet, so in this recipe, I dialed back the sweetness and balanced out the flavors. These are so much better than the ones I remember. Each bite is like an improved version of the past. One crop that I'm looking forward to in the summer is fresh corn. I love yellow corn which is hard to come by now; most of the corn available in the local supermarket is white corn. Yellow corn, in my opinion, is chewier and creamier. Now, many farmers grow bi-color corn. The complete sweetness from the white kernels and the chewy texture from the yellow kernels bring the best of both worlds in one ear. 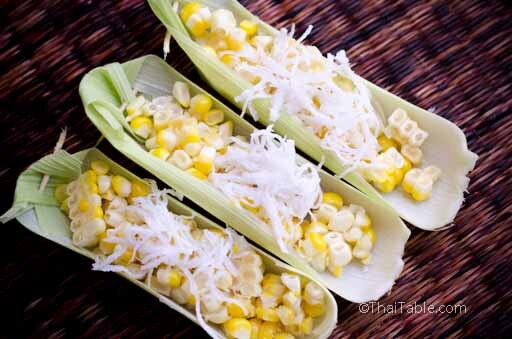 When I feel like having corn, usually plain boiled corn which is so boring. My mind zooms back to Thailand and craves a snack that is simple and tasty. Before you see coconut milk in a can at supermarkets, the coconut has to dodge a few stages where it can be eaten. With the green coconut, we drink the sweet juice and scrape the tender, gel like, white meat and eat it just like that. We also shred the tender meat and add to desserts and drinks. When the coconut shell outside is brown, the juice is not as sweet as young green coconut and the white flesh is no longer tender, it is not quite ripe yet. The white flesh is firm but not hard and brittle like ripe coconut which makes it easy to shred. 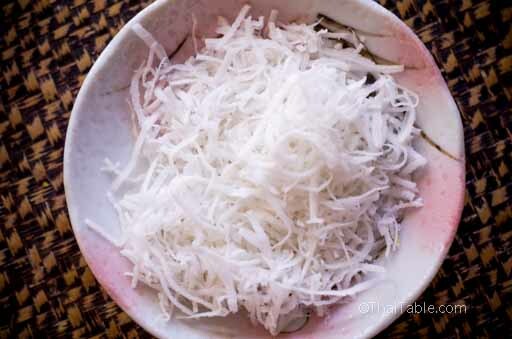 It's ideal for shredded coconut. 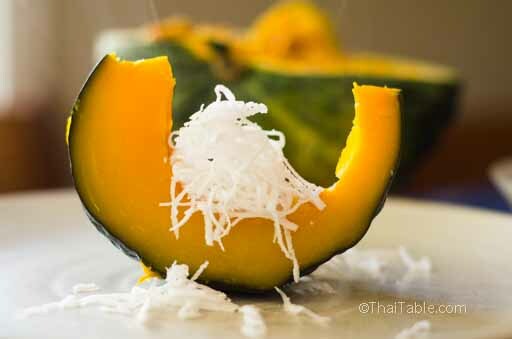 The grated white flesh is perfect as a sprinkle on top of desserts and snacks. At the end of the coconut life span, it's perfect for coconut milk. The finely grated white meat is packed with milk, ready for the squeeze. Often as I would walk through my neighborhood, I'd catch a whiff of delicious aroma coming from my neighbors kitchens. When it gets dark, as I'd glimpse people eating inside, I'd wonder what they’re eating, what are they talking about, who are these people and what kind of lives do they have. When coworkers or friends bring delicious food from home that’s been cooked by their mothers or spouses, I want to invite myself to their houses to enjoy more food. When I go to the restaurants, I wonder what the kitchen staff is really eating. In Thai restaurants outside of Thailand that cater to both Thais and locals, if you know Thai, you ask for a hidden Thai menu. That’s when you get the gems reserved for those who truly appreciate the food. I didn't grow up eating Watermelon Rind Sour Curry and I wish I did because it's so good and so accessible. I'd heard of Watermelon Rind Sour Curry from a friend and decided to give it a try. My family loves it. Now when we buy a watermelon, a Watermelon Rind Sour Curry is expected. 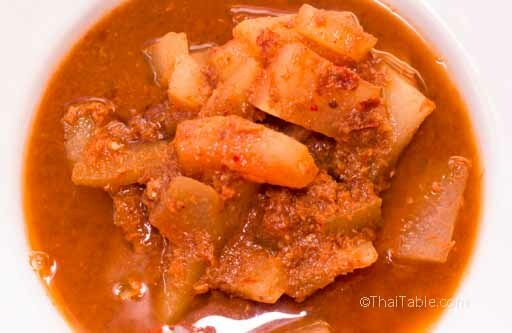 The watermelon rind works so well absorbing spices and strong flavors in the sour curry. The dense texture keeps the rind from falling apart during cooking. With mild flavor, the rind absorbs and tone down the sharp spices and flavor. Every bite of the watermelon rind is full of flavor. 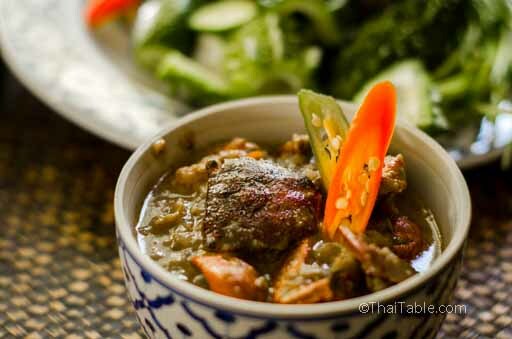 Gang Som or sour curry is more common at a Thai's dining table than red or green curries. It uses core Thai ingredients, shallots, shrimp paste, dried peppers, tamarind and fish. No need for coconut milk. It's extremely easy to make and can last several days. Several types of vegetables and vegetable combinations are common such as yardlong beans and daikon, Chinese water spinach, drum sticks, green beans, green papaya, bean sprouts and napa cabbage. Adding shrimp or big chunks of fish is also a favorite of restaurants as a way to give oomph to the homey curry. The term 'som' has 3 meanings: orange as in the fruit, orange as color and a sour taste. In this case, som is an old term referring to the sour taste. If you ever run into a recipe for 'gang som' and it calls for an orange, please note that something was lost in the translation. 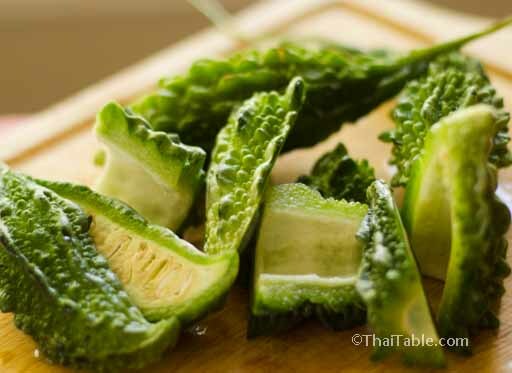 Sour Curries are native to central Thailand. The south has their version which includes fresh turmeric and seafood. Try a Southern Sour Curry, it's another of my favorite dishes. Sour curry paste is one curry paste that most people don't buy, but make it themselves right before making sour curry. 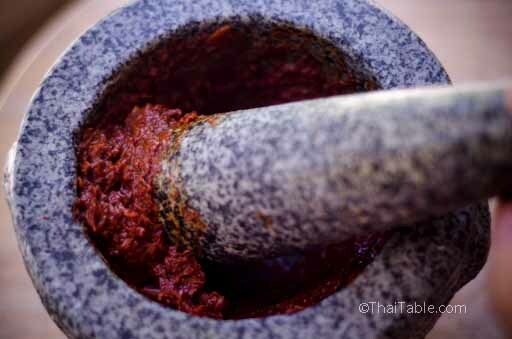 The core ingredients in sour curry paste are dried chili peppers, shallots and shrimp paste. Other added ingredients such as garlic, Chinese keys and fresh turmeric depends on the region and personal preference. I add garlic to mine. The amount of garlic should be minimal compared to shallots. Many people, including my mother, add Chinese keys to tame the fish flavor and add a nice aroma to the curry. Southern Sour Curry Paste is made with fresh turmeric and garlic.